This might be the weirdest method I've ever used when cooking. I always joke with my cooking friends that Cook's Illustrated just likes to mess with their readers - like "let's add this crazy step and see if people actually do it!" I for one would just like to know how they come up with this stuff. Take this recipe for example. The good folks at CI wanted to "rescue" them from a fate of overcooked and dry meat. They acknowledged that the problem is that chicken is too lean to hold up to the high heat of the grill. 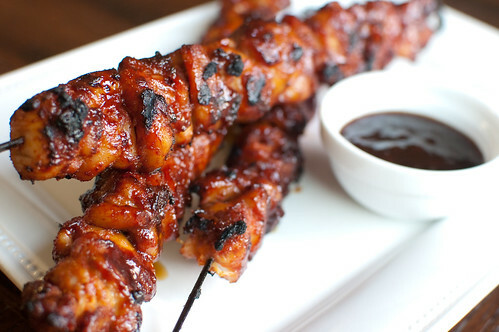 Since these are bbq glazed, bacon seems like a natural pairing with the chicken, but they struggled with how to incorporate it. After trying several methods, they finally,somehow, figured out that the best method is to - get this - pulse the bacon in a food processor to form a paste, then coat the chicken with it. Crazy, right?! But it worked! This was definitely one of the best dinners we'd had in a while, and Joey and Caroline both seemed to agree. The bacon does keep the chicken from drying out, while simultaneously giving it a smoky flavor. Joey proclaimed this to be one of his favorite dinners, so I have a feeling I'll be making bacon paste all summer! For a gas grill, turn all the burners to high, close the lid, and heat 15-20 minutes. Meanwhile, pat the chicken dry with paper towels. Combine the paprikas, sugar, and cayenne in a small bowl. Brush the top surface of the kebabs with 1/4 cup sauce; flip and cook until the sauce is browned in spots, about 1-2 minutes. Flip again and brush with remainign 1/4 cup sauce; continue to cook until browned in spots and cooked through, about 1-2 minutes. Looks tasty! CI does come up with some wacky methods. I will definitely have to try this out at our next dinner club. Always love to throw in an unexpected twist to keep our friends on their toes. This recipe has summer written all over it! I will be making once it finally warms up! This is going straight to my parents email account because they eat really bad dry bbq chicken almost every night during the summer. You've probably made my siblings' lives infinitely better by posting this! bacon paste is a new one for me, but everything is better with bacon! These sound delicious! I'd totally be one to give in to the CI crazy step. Kebabs are so awesome! Love the BBQ on this! This is really dangerous. There should be a user warning. Thank the bacon god I don't own a food processor or I'd be carrying a little jar of bacon paste with me everywhere I went. This method is genius. Sounds delicious! It's going on my dinner menu for sometime this coming week, thanks! Bacon goes with anything, doesn't it? Great recipe, look forward to trying, thanks for sharing. This is ..... interesting :) And cool shout out today on PW. Those taquitos are pretty darn tasty. I just made this and have to say, bacon paste is amazing!!!! Best chicken kebabs I've ever had. The bacon isn't overwhelming, it just adds smokey delicious richness and keeps the chicken from drying out. GENIUS!!! 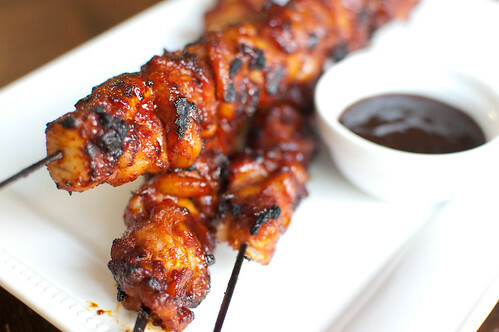 Yum, I can't wait to try these, how perfect for a summer cookout! They sound absolutely delish! Thanks! Book marked and ready to eat this now! I love that you smothered it in bacon! Totally making this for my family this weekend! I made these last night with chicken thighs. They were AMAZING! my 5 year old ate two HUGE kebabs full of chicken. Thanks so much for sharing, these are definitely going on the summer rotation! haha i wonder about CI's methods too... just see if people will actually do it?? :-) sounds pretty good though! I just read this article, too. Glad to see I'm not the only one with this on the menu. Glad to see that it worked and tasted good. I just made these last night. The sauce is soo good!! I made these last weekend and they were sooo good! The bacon paste was a bit weird...and a bit gross to mix in, as mixing it with the chicken by hand seemed to be the best way to coat it, but it was totally worth it! Is the bacon paste made with raw or cooked bacon? It is raw. It is rubbed on the chicken and cooked along with it. That's how the chicken gets the smoky flavor. This is a wonderful idea and recipe even if I can't imagine making a paste out of bacon... Have to try this for saturday night's bbq! do you think you could do this over the space of 2 days? salt the chicken, then rub with the spices and bacon paste, then leave overnight to grill and serve the next day? I am catering a big wedding dinner and think these would be perfect! but I have to do a lot ahead of time.